You will not believe that this cake is prepared with ragi flour and whole wheat flour, if you had not seen the title. 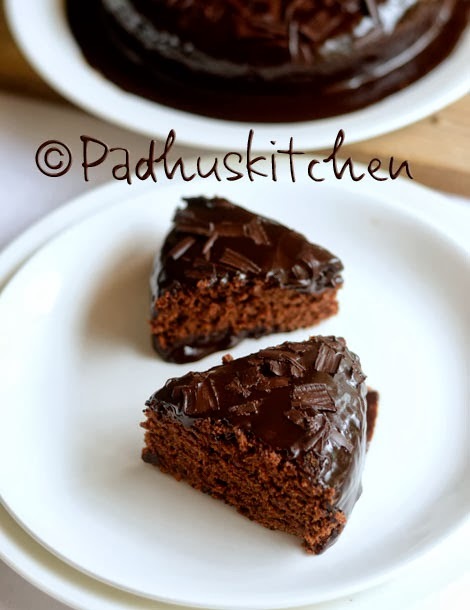 I wanted to make this ragi cake since the time I saw the recipe here.This finger millet/ragi cake is very chocolaty, dense and filling. With chocolate sauce topping, it was simply fabulous. Besides tasting great, it's literally a breeze to make. You do not need an electric beater, just mix the dry ingredients with the wet ingredients using a wire whisk, that's it. When I gave it to my friends and told them that this cake is prepared with ragi flour, they could not believe it. It is a great after school snack for kids and no doubt they will love this cake. You will have the satisfaction that you have made a healthy cake without all purpose flour.You can prepare this cake for birthdays, get togethers, parties, friends etc. Today we will learn how to make this guilt free ragi-wheat flour cake following our step wise pictures. Dry ingredients -Sieved ragi flour+wheat flour+cocoa powder+baking soda+salt and powdered sugar. Wet ingredients - Yogurt+honey, oil, milk and vanilla essence. Mix the milk, vanilla essence and oil to the yogurt+honey mixture. Now mix the wet ingredient with the dry ingredients until well combined. Do not overmix. If using chopped walnuts, dust it with a little flour and mix it gently with the batter. Now cook the mixture on medium heat until it starts boiling. Once it starts boiling, reduce the heat and cook stirring the mixture continuously until it starts thickening and reaches a sauce like consistency. Keep the bar of dark chocolate outside the refrigerator. After half an hour, using a vegetable peeler, peel out chocolate curls. Then refrigerate the chocolate curls until it hardens. Sprinkle over the cake and enjoy!!! awesome padhu .. it turned so moist and nice. 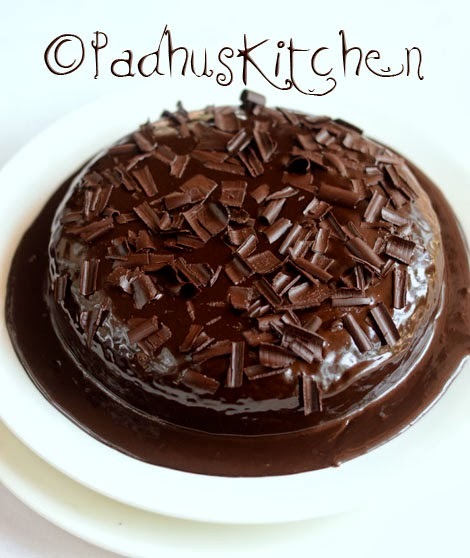 This is really a healthy delicious cake Padma.. Looking soft and absolutely yumm.. I have not tried it yet, so I have no idea. Wow, this cake really tempting.. So soft and delicious.. Astonishing presentation, feel like licking that chocolate sauce..Beautiful cake..
HI Padma, looks wonderful.. any way to replace ragi???? You can use all purpose flour or maida but that is not healthy. Hi padhu, (with regard to previous query by manjula),I hv tried ur eggless vanilla cake in micro wave. Took 7 min in high (900w). It was awesome. I will try this one too. i understand this is eggless cake..but if i want to use how much eggs should i use in this one? I loved the idea of ragi in cake, i have the ragi floor in mya pantry and really want to use it now. Can I bake this cake in pressure cooker ? If so how should I do that? Yes, you can. Follow my Vanilla cake in pressure cooker. Can you let me know where i can get the parchment paper and muffin liners (for baking muffins) in chennai? i tried in couple of shops but was not able to get it. You will get in all the shop in waltax road. You get all things needed for baking there. Hi Padhu. This is really awesome. I want to try. But i have microwave grill model. Will it work? We made this for a friend's birthday. It turned out great! We just had to add a little more milk and oil to the wet mixture. I'll make it a point to share this recipe. Thanks! Tried this for my hubby's birthday, turned out great. Thanks for such a great and healthy recipe. Like a lot of people I did doubt if this would work ! But made it for my husbands bday and we were floored !!! This is definitely a keeper ;-)) I in fact used jaggery instead of brown sugar and still it turned out marvellous ;-)) thanks Padhu ! I would like to know what is ragi flour, where do we get it? Ragi flour is finger millet flour. You will get it in all Indian stores. Yes, you can. Check out Padhuskitchen FB page. A reader has steamed this cake and it has turned out so well. Can I make this cake in Pressure cooker (Following "Baking Procedure given in "Pressure Cooker Cake"). Please reply. You can bake this cake or any cake following the Cake in pressure cooker method. Can I keep this cake out of fridge for a couple of days? I am going on a vacation with my 1yr old, so thought of taking some home made snacks for her during the trip. Yes, it stays good for 1 or 2 days at room temperature. Can the cake recipe be used for making chocolate muffins?, should i alter the temperature? I am new baker and keep looking out for healthy options..Thanks for this one!! If I skip sauce , will taste good? With sauce, it tastes amazing. But if you want to skip sauce, may be you can increase the quantity of sugar a little more. Hi! Ur cake looks tempting and delicious. But just a doubt that i had was, if it is spongy? Without eggs being used in it. Coz i bake eggless cream cakes and add sugar syrup in between the layers. Here i wanted to know what ingredient makes it soft and spongy? The cake will not be spongy but moist and dense.It will be very delicious with the chocolate sauce. Yes, you can experiment in less quantity. Just increase the amount of sugar a little for those cakes. Hi, this looks so delicious! Do I have to make any changes to bake in a 9 inch pan instead? Also, what changes should I make to double or triple the recipe? Thanks. No changes for 9 inch pan- just follow the recipe. If you want to double or triple the recipe then calculate accordingly. Whatever pan you use, make sure you do not fill the pan a little more than half. Hi can I use jaggery instead of brown sugar? If you can get organic clean finely powdered jaggery. Most of the jaggery commonly available in the market has impurities. Yogurt is added to replace eggs. Do not omit that. You can go for low fat plain yogurt. I get confused bet yogurt and curd. Are they same?! If yes, then can we use curd? !If no, how to get yogurt?! I wanna try this cake so badly, so pls guide me! In India both are the same.Here in India, the words Yogurt and curd are used interchangeably. The cake will be a little thin. You do not have to put the cake in the fridge as the sauce will set. You can but I am not sure about the taste as I have not tried it. HI! I tried this for a friend's bday n it was simply awesome!! Thank you so much!! Only thing though is that the sauce was not saucy enough. It didn't thicken as shown in your pic! Any suggestions?? How do I upload a pic here to show you the cake? You can use melted butter to replace oil.Melted butter can be substituted for oil in cakes. You can even substituted apple sauce but I have not experimented with it. Could you please tell me how many ml in your 1 cup ? Hi padhu....I prepared for my daughter's picnic and all kids loved it...thank u for the recipe. Dear Padhu, I would like to reduce the quantity of recipe to half. Then what will be the temperature and baking time? Same temperature. Regarding timings,I am not sure. You have to check it with a toothpick. If it comes out clean it is baked. The cake turned out good.. I replaced the curds with 2 eggs and added 80 gms melted dark chocolate for an intense chocolate taste.. The initial bite did taste like aataa but then it tastes really yummy.. Thanks!! Can you suggest anything to replace honey as they say honey when its heated becomes toxic. You may skip honey and add more brown sugar. I mostly use the bottom element when baking. Hello! The cake came out amazing. Thanks so much for this lip smacking recipe. My sauce did not turn as good as yours. How long does it take to thicken? Thanks. Thank you. Happy to know that the cake turned out well. It will take 6-7 minutes on medium heat. You must cook until it thickens a little. As it cools, it will thicken more. Can we bake this only with wheat?! Lovely cake.came out so moist and good. Thanks for the lovely receipe.Good feel to bake a healthy cake for kids. You can use 9 inch pan but do not fill more than half. A little more than half is ok. Rest of the batter, you can bake in a cupcake mould. You can use any pan but avoid filling up to the brim. I'm baking your recipe,it's in the oven..batter tastes yum, I hope it will come out fine. I added multi millet flour instead of ragi as that's what I had in my kitchen.didnt add honey. Hope to see more millet recipes,thanks! Made the cake today, came out great! It's 1st time I have made an eggless cake. Hi Thanks for the receipe. But it's very sticky don't know what I missed in that. Even then it tastes good. If you cool the cake properly on a wire rack, it will not be sticky. You should not cover it until it has cooled completely. It turned out to be perfect. Cake came out so well and taste yummy.. loved by my kids.. Thank u so much for this healthy recipe.. May i know how many days we can store this cake in fridge? I would like to pack it as snacks! Toooooo good a recipe, I tried it n it came out very well....my daughter loved it very much and was asking for more...thanks for sharing such a healthy n to top it, a very delicious cake. Can u pls tell me, if I prepare d chocolate sauce in excess, for how long can I store it?? Once again thanku for d healthy cake..
Glad you liked the cake. You can store chocolate sauce in a tightly sealed container in the refrigerator. It stays good for a month. Store it within an hour of preparing it. Your recipes are too good. If i skip curd, will it be Okay? How do i prepare using Microwave. As it is an eggless recipe, curd is a must. I don't use microwave for baking. I use only my OTG oven. Yes, you can use melted butter. I am not aware of masti dahi. Hi, can I use any other flavoured essence other than vanilla like pineapple??? Or can I skip it altogether?? I don't think pineapple essence will go well with ragi chocolate cake. Use vanilla. Hi... cake turns out well. May I know how long it will stay good in room temperature. I live in eastern part of US still it’s cold here. Do I need to refrigerate for more than 2 days use? I do not have baking soda. How much baking powder can i use? Wheat cakes, ragi cakes are dense. They will not be fluffy as cakes made with all purpose flour or maida. You should have baked a little longer, as I assume your cake was not baked properly, hence sticking. Tried tge receipe, it turned awesome. Hi I. Have tried your choc cake many times. All times it came out well. Thanks for your posting dear. You mean to say you want to powder ragi in mixie at home and use it. Yes you can, but it is very difficult to powder it finely.It is easier to get readymade ragi flour. Would this work with sprouted ragi flour? How much more sugar or honey do you think this would need if I make it without the sauce?